Devs will have three settings to control the functionality of autosizing text in their apps. There is Default, which scales text along the horizontal and vertical axes within the bounds chosen by the dev. Granularity lets devs change the size of each step as text resizes. Similarly, developers can use preset sizes to manually control the values TextView uses as it resizes text. Developers could do similar things before with third-party workarounds, but the official support library will make it much easier. 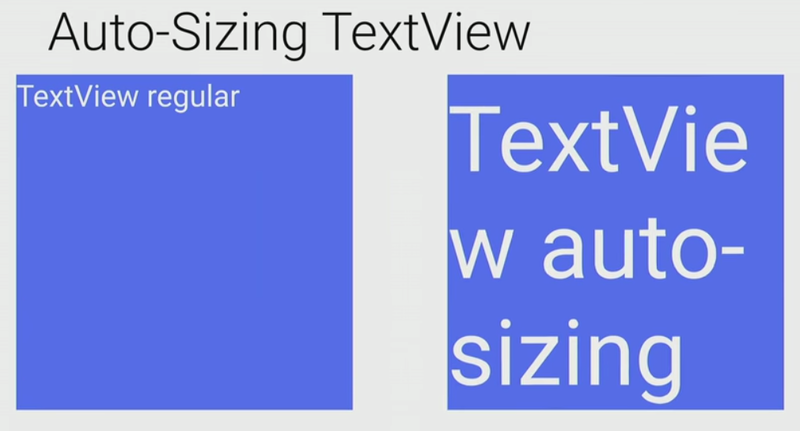 The autosizing TextViews are not specific to Android O, although it is a new tool for developers. Autosizing TextViews are part of Support Library 26.0 Beta, which supports all versions of Android back to 4.0 Ice Cream Sandwich. So, this is one of those subtle features that will begin showing up on your phone as developers improve apps even if you don't get an update to a newer version of Android. Developers will probably use it, too. There are tons of StackOverflow posts complaining about non-resizing text on Android. The upshot for you is that stuff will fit better on your screen. If you change the size of a field or fill it up with text, the text can change size to make sure it's all still visible. The Support Library 26 is still in beta, but it should be available in stable form alongside Android O later this year.